My first question to myself was what is Advocacy Day? As an employee of A Woman’s Place and new member of the Bucks County Women’s Advocacy Coalition (BCWAC), I had heard a lot about the infamous Advocacy Day but I did not know what the day had in store for me. Boy was I in for a treat! The day started with a well-arranged car pool meet up. You may be thinking “why is she talking about the car pool” and I’ll tell you why. First, the amount of organization that went into this day was outstanding and it started with the car pool list. Second, even the car pool time was used to iron out last minute details and questions about important legislation. I could feel the passion and excitement in the air. 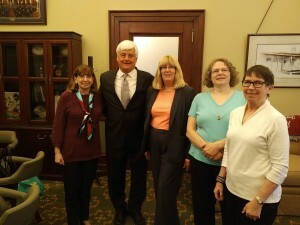 BCWAC members were instructed to meet in the Rotunda upon arriving in Harrisburg. It was there where I had the opportunity to meet other BCWAC members and listen to the buzz amongst the advocates about what particular legislation would be their point of discussion with representatives. After a quick pep talk from the President of BCWAC, Tam St. Claire, the organized teams set off to begin their Advocacy Day journey. My team’s first stop was with Representative Scott Petri. To be honest, I was very nervous but, knowing that I a part of a team of seasoned advocates eased my angst a bit. Representative Petri was in his office and we had about 30 minutes of face time with him. Members of my team collaboratively spoke to the Representative about direct legislation and talking points related to that legislation. My team continued the day with meeting an assistant of Representative Gene DiGirolamo and later with Representative John Galloway. Finally, a larger group of team members sat with an assistant of Senator Chuck McIlhenny. Tam St. Claire facilitated the discussion while other advocates added their input throughout the conversation. After representative meetings were finished BCWAC advocates met in the Rotunda once again. At this time people offered their final thoughts and the message was “job well done”. After reading a small piece about BCWAC’s Advocacy Day, some people may not think it was that special but it was. Aside from meeting with Representatives, or their assistants, there was so much more happening that day. Having the opportunity to see a bunch of people get together to advocate for a common cause is a very powerful experience. Every member that I talked to was more than willing to offer their help or explain a process or legislation. They seemed eager to educate and I was equally as eager to learn. I was surrounded by BCWAC members who were passionate about the work they do and that experience in itself was inspiring. It reminds me WHY I do the work that I do and gives me pride to be involved in a cause that is much larger than myself. I am grateful to have had the opportunity to take part of BCWAC’s Advocacy Day and I feel lucky to be surrounded by such empowering women. I am excited about the advocacy events and learning opportunities in the future!